What's new in Direct to Garment printing? Sophie Matthews-Paul explains which technology is available for direct to garment and how it can be used for this growth market. Direct-to-garment printing, or DtG, is one of the buzzwords we are starting to hear more and more often in wide format circles. It basically means using a digital printer to print directly onto clothes and accessories, and the process is turning a lot of heads. For entrepreneurial designers and printers looking to provide new services, DtG is a no brainer because it is ideal for short runs. DtG makes garment design and printing simple, accessible and cheap, especially compared to traditional screen printing. Put a DtG printing system at the back of a web to print platform, supporting online customisation and order processing, and you have all the ingredients for an exciting new business model. DtG print using inkjet technology is attractive because the process of creating a printed garment from scratch using traditional technologies can be long and complicated. The printers are easy to use, affordable and print great quality images directly onto a variety of small to medium format shirts and accessories quickly. Different fabrics will have different characteristics making them suitable for different types of design and the printed result must also be able to withstand washing. The inks must stick to the fibres and not lose their colour too readily despite the weather or how often they are washed. And, of course, the fabric must look and feel natural and not irritate its wearer. Inkjet printing technologies are available in many flavours and can be configured to print on natural fibres, polyesters and blends, without compromising the feel of the end result. The reduction in production steps, compared to traditional processes, and the technology options also means that the cost of production can come down. This makes it possible for anyone to print their own garments – with relatively little expertise – and supports business models that offer a high profit per garment. Along with reliability and productivity, cost is one of the main drivers when it comes to choosing the right production technology for your wide format project. But cost can be subjective and is always relative. For instance, if you are printing more than a couple of hundred T-shirts, all of which are the same, you are probably better off with conventional screen printing. If you want each T-shirts to be different and you want them printed in a four-colour photographic process, digital printing using a compact, DtG desktop printer is really your only cost effective option. This is especially true if you have a multilayered halftoned design and you are not using specialty inks such as metallics. The high worth nature of bespoke garments is also something to consider in your DtG project planning. This is one of the reasons why DtG digital printing is rapidly taking off. Compared to conventional garment printing DtG has a much shorter supply chain and has a much quicker production turnaround. Unlike screen printing, which requires the preparation of a screen per colour, digital inkjet printing enables you to print a multicoloured image direct to the garment in just a few minutes. Plus, with a DtG production line, digital colour management ensures that the colours a designer intends are the colours the printing system delivers. DtG printing systems can exploit the sophisticated and widespread modern prepress workflow technologies used in commercial print and publishing. These workflows can handle a wide range of output options, and although the workflow management technologies are relatively new to DtG production, the basic principles of production and colour management can still be applied. 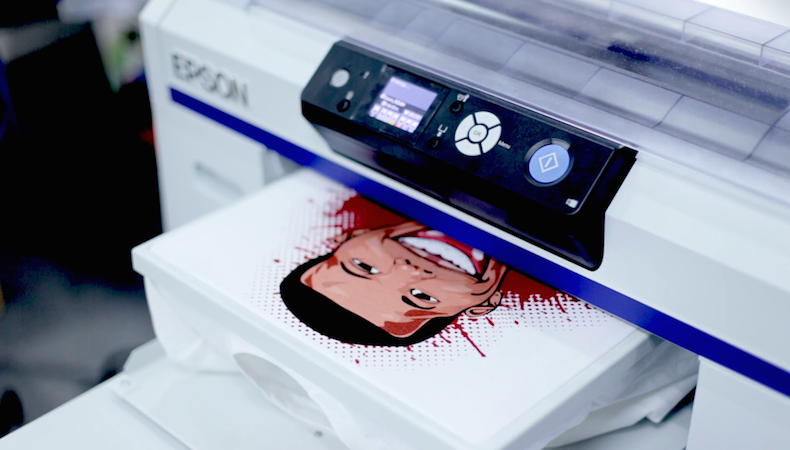 Digital DtG printing systems are available that handle all pre- and post-treatment to produce T-shirts, sportswear and other items of clothing and accessories – such as baby grows, hats, bags, napkins and T Towels – on demand. Manufacturers large and small, are getting into the DtG act, but the biggest is Epson which has been involved in this field for several years and is fast becoming the best known name in the DtG field. The SureColor SC-F2000 for instance is a DtG digital printer that Epson has specifically designed to print direct to garments. Other devices available include the Anajet which is distributed by Ricoh. This printer requires pre and post treatments, using heat to cure the water based pigment inks. Kornit is another option, with platforms designed for on-demand DtG as well as mass production. The SureColor SC-F2000 T-shirt printer. Workflow is what makes or breaks pretty much any project, so make sure you think things through beforehand. When you create your design, consider the application you will use to do it. Ideally you want something that supports different output formats, so that you can optimise your files for different printing systems. At the very least you need to be able to create raster files as JPEGs and TIFFs. Consider the output size of your garment and make sure that the printing system can support it. Look for a system that provides a choice of platen sizes and that the system’s layout software can position your file as you want it. Your design may need to scaled or otherwise adjusted to fit the platen. Also ensure that the layout tool can adjust colours as needed and control the amount of ink that is laid down. Apart from concerns about quality, such as infilling in your design, using more ink than you need means you may be spending more than you should. The materials you are printing onto should also be rated for stain and rub resistance, ideally with a rating from the AATCC which has a international standard method for testing fibers and fabrics. These tests measure a range of performance criteria such as visual appearance, colour fastness, water resistance and dimensional change. ISO 105-E01 is another standard test for colour fastness in water. DtG shops are starting to popup on high streets and on line. Mad-in-Berlin for example has two locations in the city digitally printing souvenirs and T-shirts on demand, and has a healthy online business too. Basic products such as a Yoko backpack can be customised with your name and images, or you can create your own products from blank generics either at the website or in one of the Mad-in-Berlin shops. Perhaps you want high visibility jackets with your logo and web address? Or rain ponchos with the map of where you want to go hiking? Maybe you even want to sell ponchos printed with local maps from a village shop out in the countryside? Creating such high value items is what DtG is all about and it’s a perfect way to come up with ideas that capitalise on bespoke, customised and localised production. In much the same way as digital printing technologies are upending conventional print, so the same thing is starting to happen with garment printing. It’s too early to say when DtG printing will become a totally digital industry. But if you are interested in short runs, prototyping and customised garments the possibilities available to you are about to get very interesting. Visitors to FESPA Mexico 2017, from 21-23 September at the Centro Citibanamex in Mexico City, will be able to discover some of the latest direct-to-garment print technologies from various manufacturers in one place. Now in its 10th edition, the regional event has become an established, successful trade show, attracting an audience of 10,000 print professionals. For more information on the event and to pre-register visits: www.fespamexico.com. For FREE entry, use code MEXH718 when registering.